One tends to think of information design as a new profession. Yet Paul Kahn gets his inspiration from visual designs as old as the Romans. 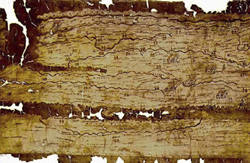 According to Kahn, the Peutinger Table, a 12th century reproduction of an ancient Roman roadmap, was not drawn to scale and the north-south axis was flattened. Nonetheless, this odd-looking “squashed” map folded away neatly and communicated vital information to travellers including the location of towns, the distance between towns and the best route to take. Kahn suggests that good design focuses on the essential information and may simplify or distort it if doing so improves communication or convenience. A more recent example comes from the London Underground. Realising that the actual curves were not important in a transport system, Harry Beck regularised the shapes in the London Underground map, making it much easier to understand and use. He also increased the space between stops in central London and reduced the space between stops outside of central London. This made it possible to get more on paper and make a pocket-sized map. Kahn’s interest in maps extends to the enterprise web space. He and his colleagues use ‘glyphs’ to capture and communicate information architecture. ‘Glyph’ is derived from ‘hieroglyph’ and is a compact visual representation, full of symbolic meaning. 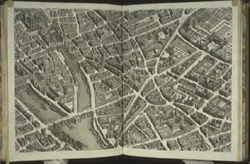 Using isometric information maps, such as the Turgot city maps devised during the 18th century, Kahn and his associates have been able to map the voluminous digital information available to clients such as the Bibliothèque Nationale de France. They use the visualisation to explain how information is scattered on a website or over several websites, and how they propose to reorganise it. The information may be reorganised in any one of several ways: by location, alphabetically, by time, by category or by hierarchy. 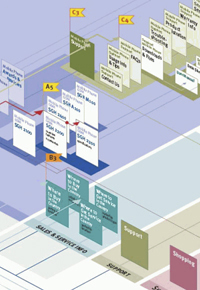 Visualising information the Kahn way is demanding, but it is a good way to make information transparent and reach consensus on the most appropriate information architecture. And in Kahn’s work with clients, the benefits from thinking in terms of an “enterprise web space”—all the digital assets that your company has or that exist in your field—have become clear: easier access to information, improved usability and greater interoperability. 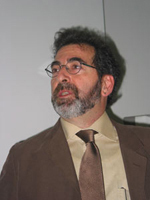 Paul Kahn is a leading international consultant, speaker and author on web site architecture and visualisation. His activities in the United States included director of the Institute for Research in Information and Scholarship (IRIS) at Brown University, co-founder and president of Dynamic Diagrams and adjunct professor at the Rhode Island School of Design. After moving to France in 2001, he became managing director of Kahn+Associates, an information architecture consulting group based in Paris. He currently teaches in the Master Multimédia Interactif, Université de Paris 1 (France) and as a guest lecturer at MediaLab, University of Art and Design, Helsinki (Finland). He is the co-author of Mapping Web Sites (with Krzysztof Lenk), which has been translated into French, German, Spanish and Korean. 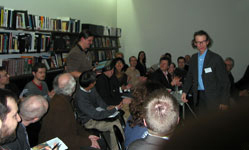 He is also the editor of NEW Magazine, an annual publication devoted to international verbal and visual communication.